Squirrel Creek Creations: We're nuts about masks! Today's feature goes to Nathalie Van and her amazing and creative mosaic paintings. 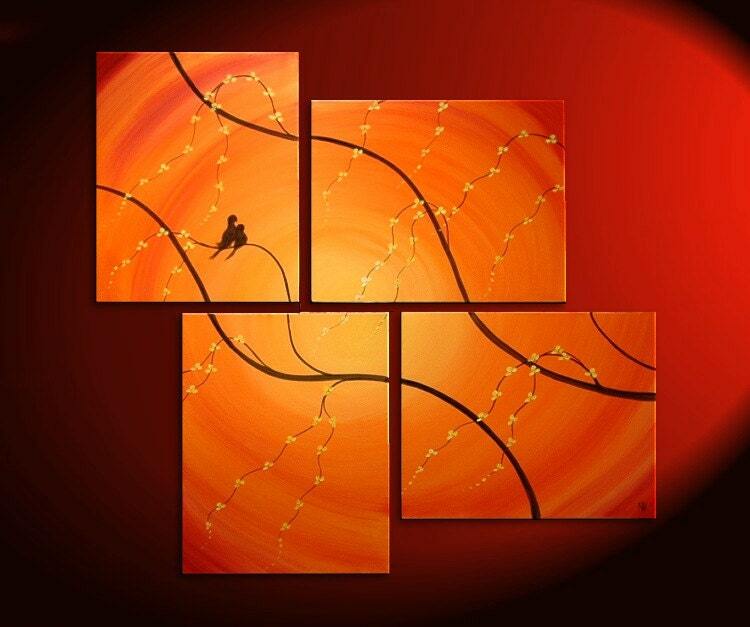 Van's paintings are often described as, "calming, emotional, simple and elegant. Her art makes the viewer feel a sense of relaxation and centeredness, bringing a sense of peace and rest to the area where it is displayed." Her art has been highly revered and she is quickly becoming one of Canada's top artists. With paintings being sold to almost every part of the world, it's not wonder that her art made it on the wall of the CBC show Michael: Tuesdays and Thursday. 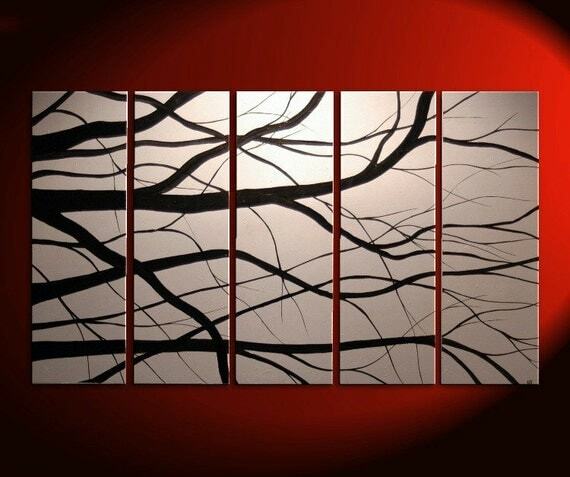 The series on display is a set of 22 paintings that were crafted to create ambiance for the show. Van is often requested to create paintings to fit in a specific space. Many of her customers will go as far as e-mailing pictures of their home to help Van visualize the space and craft something special for it. Van also has a book published with 172 of her early paintings. The book includes paintings from the very start of her career up to her 551st painting. 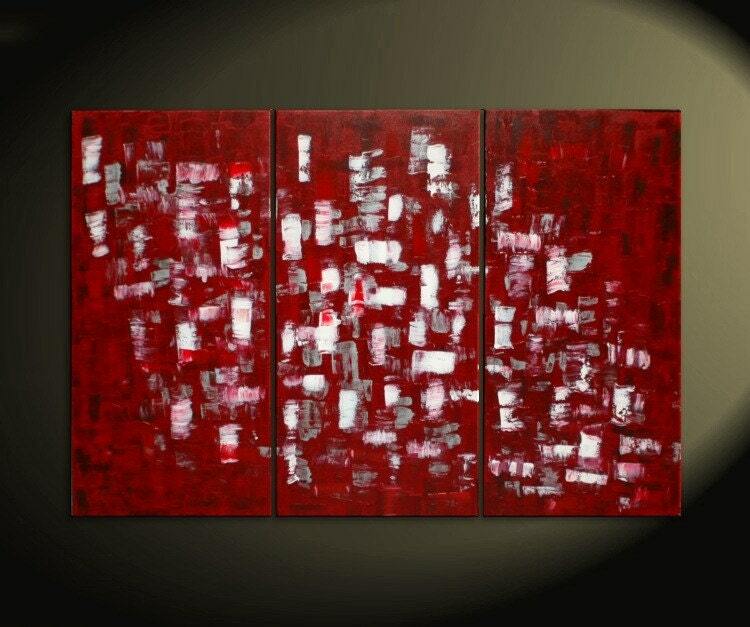 A variety of her art styles are covered from cubism to abstract to Asian infused. Her paintings are both shown alone and in furnished settings. The paintings themselves may vary in size, colors and content, but there is a sense of unity throughout her work. Most of her paintings are made up of several to many smaller paintings. What makes them special is they seem as though they could be viewed individually or as a whole. By themselves, each section is compositionally strong, but as a unit it becomes magical. For example, look at Safe With You (shown above) as a whole first. Notice the smooth circle of light glowing from the middle and pulsating to the edges. The hourglass shape of the twin branches as they come together, move apart, then return to each other only to repeat the cycle. Feel how they eyes are constantly drawn up and to the left by the lines and always end up back on the love birds. Now, cover up three panels and look at each section by itself. 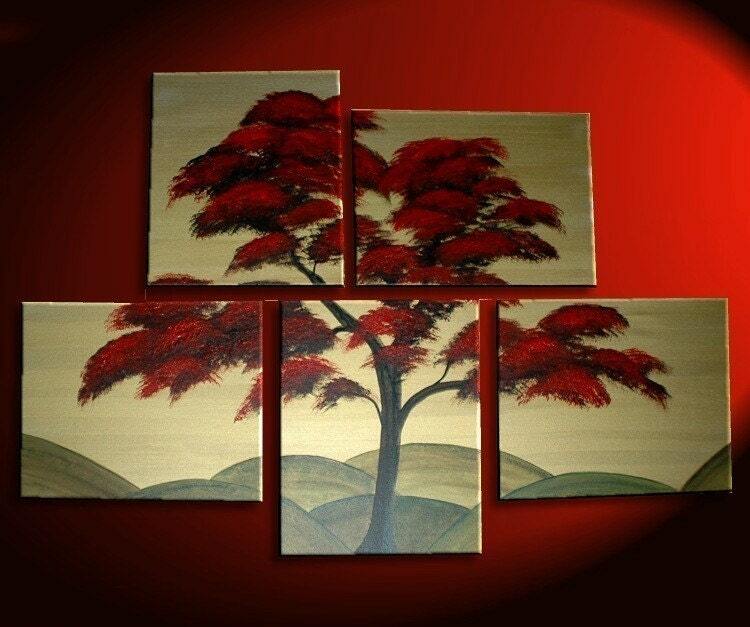 For instance, the upper right panel alone is beautiful painting of soft, warm colors and a deep cutting branch. The little flowers pull the eye out from the branch to the edges where the swirl of paint gently pulls them back in. If a portion of the painting wasn't compositionally sound, it would hurt the piece as a whole. But because each section has been carefully planned and painted, it becomes visually dynamic from corner to corner. Nathalie Van's Asian influences can be found in images such as Fall Leaves 1 (right). The simplistic hill forms are reminiscient of ancient paintings while the deep reds echo hues used in times long passed. Again, the strong form of a tree cuts through the painting as a whole, but it's partially obscured by the leaves. Just as in Safe With You, each panel can be pulled away to be enjoyed by itself but the painting is strongest as a whole. Wow, thank you so much for the wonderful feature! You really did your research and I'm so grateful for the kind words. Glasses Modification Tutorial - Wear glasses with your mask! Squirrel Creek Creations. Watermark theme. Powered by Blogger.